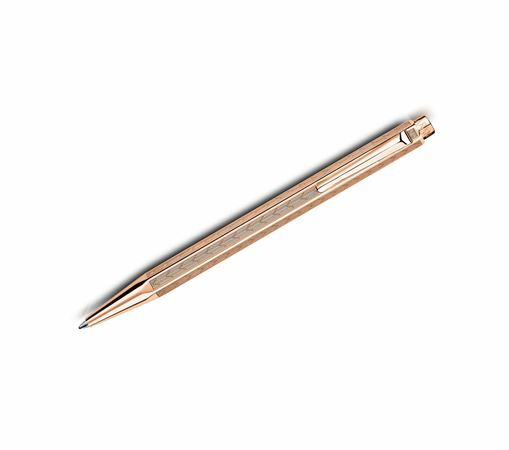 Order your Caran D'ache Ecridor Chevron Rose Ballpoint Pen today from FahrneysPens.com. Fine Pens, Refills & Luxurious Gifts – great prices & fast shipping. Since 1953, the Ecridor ballpoint pen has represented the fusion of an authentic, contemporary style with reliability demonstrated by its mechanism emblematic of the Swiss-made precision. The play of light and sparkle reflects the expertise of Caran d’Ache artisans’ in guillochage and polishing, enhancing the pleasure of writing. The famous hexagonal design is covered with precious metals, making Ecridor a timeless icon of elegance and finesse while being a superb writing companion. Following the palladium and gilded finish, the Ecridor Chevron collection is adorned with a new rose-gilded finish. It reveals all the brilliance of rose gold to become a new timeless icon of elegance.